Today I was in a hurry. I got up in a hurry (late), I walked the dog in a hurry, I ate breakfast in a hurry… you get the picture. It didn’t get much better till lunch time by which time I had got through all my chores and made it to my goal: riding my bike 🙂 Ahh! Life slowed down. Hurry is a horrid feeling. You risk over-looking people and you miss out on simple pleasures (such as food). But sometimes it feels unavoidable and sometimes we actively wish ourselves forward in time because we are unsettled about our present. Last week I had an experience that taught me something useful about hurry. I went to an organ recital. 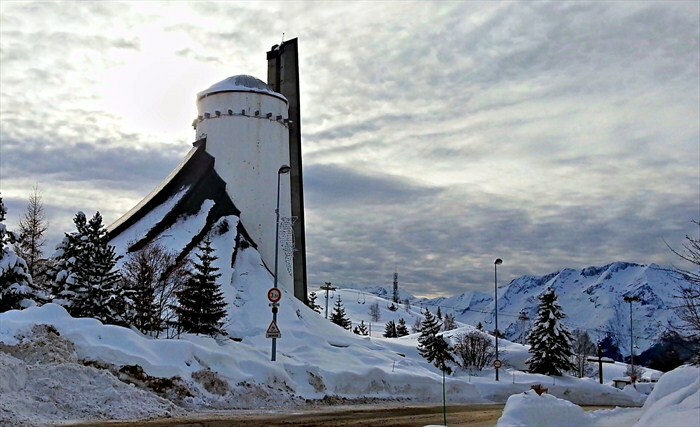 This was a strangely cultural experience for us but we were away on holiday in the French Alps, so we were up for new experiences and we’d found this amazing church: Notre-Dame des Neiges in Alpe d’Huez. From the outside it looked, to be honest, like a grain silo. Not at all attractive. But from the inside. Wow, oh wow! 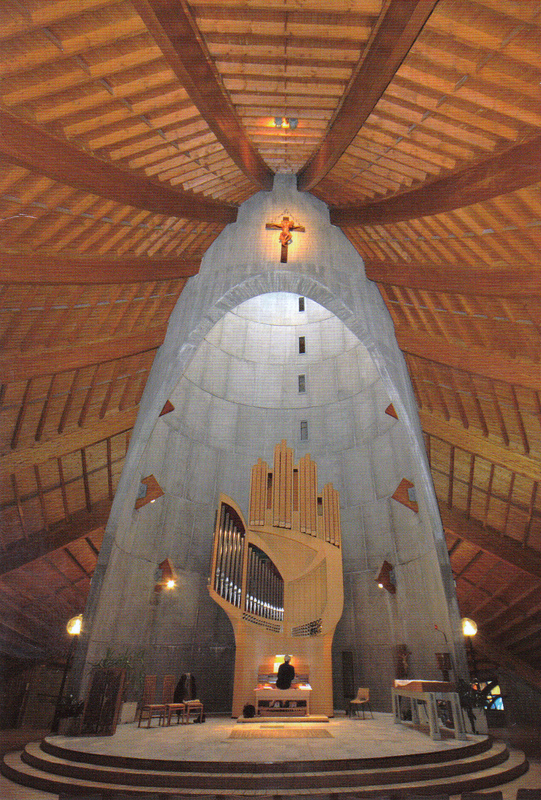 The inspiration for the building was Abraham’s tent and the idea the architect was trying to communicate was that of God pitching his tent in Alpe d’Huez. The ceiling draped around the congregation like a tent with the concrete shell that surrounded the altar and contained the organ acting like a centre pole. It also had the most extra-ordinary organ which, as you can see in the photo, formed the focal point of the worship, right behind the altar. Shaped like a hand, presumably to mean that music gives us a ‘hand’ up to God? (The organ also had a name, not a manufacturer’s name, a personal name and it had a human god-parent, which was a little strange I must admit). But anyway, when we heard there would be an organ recital, I was very keen. David, it has to be said, was not so enthusiastic but he came anyway. It was AMAZING! At least I thought it was. For starters this was the first time I’d ever really watched an organist in action and fully appreciated the fact that the organ is an instrument you play with all four limbs! I’ll could have sworn his legs were not really attached to his torso, they moved from left to right as if they were attached to pulleys. Obviously, having short legs would rule you out as far as organ playing goes. So that was a visual treat. The music was the real treat. An organ has away of swelling the sound which is quite magnificent. But organ pieces do go on a bit and they have a lot of ‘false endings’ in other words moments when you think it’s all over but no, suddenly he’s off again. For David who was not quite getting into the spirit of a the recital and was thinking about his tea, I could tell this was getting exasperating. In one of the less appealing pieces and sensing David’s impatience, even I found myself willing the guy who was only there to turn the page to turn the page! And that’s when it occurred to me…. you cannot hurry music. You cannot listen to it in a hurry, you cannot play it in a hurry (not if you want to play it properly anyway). You have to take it as it comes. I should really listen to more music. The Bible has a phrase ‘in the fullness of time’ which I’ve never really understood but watching the organist and waiting for the page to turn gave me an insight. The days of my life can only ever be played at the speed they are given me: 24 hours each day, 7 days a week, 12 months a year. And every day given is a gift. No matter how much I dislike today or wish myself forward to a different tomorrow, I cannot make it go any sooner or come any faster. God is the ultimate organist but he turns the pages for himself. If we are allowing God to orchestrate our lives then we must be patient. The music may sound like it’s reaching a conclusion but actually there may still be 40 bars to go. ‘In the fullness of time’ I can trust God that he will turn the page of my life and conduct me forward maybe into some new melody. Too often I find myself saying impatiently to him, ‘turn the page, c’mon, turn the page’ but that is to miss the gifts of today, which I need to receive with joy: the friendship, the love, the jokes, the meals, the cups of tea, the phone calls, the hugs, the tears, the list of tasks and even the chores. I loved the way each piece of music eventually reached a resolution and came to a stop; some of them trembled gently to an end with a series of fading notes and some blazed out in series of resounding chords. It didn’t matter which, what I loved was the sense of resolution. It was breath-taking. No wonder there was a pause before the applause. Only a few (like David) were thinking ‘is that it? has he finally finished?‘ All of the rest of us were thinking ‘Oh wow, how amazing!’. I hope my life will end like that. Not with people wondering ‘Oh, good, is she finally done prattling on?‘ But with a sense of completion and resolution. I guess I’m going to have to trust the organist on that one. Art of any form shouldn’t be rushed. Recently we went to see Mark Rylance’s production of Twelfth Night which was brilliant. My wife and I saw an RSC production years ago and the words were said so fast we couldn’t follow what was happening – we didn’t even realise it was a comedy! Music shouldn’t be rushed but neither should it drag; there is a right tempo for each piece that enables it to be appreciated in all its glory.